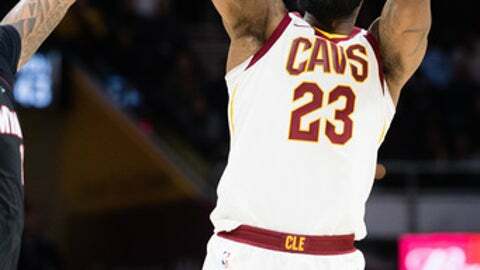 CLEVELAND (AP) LeBron James moved on quickly. A day after the Cavaliers overhauled their roster with a tornado of trades that ripped through the NBA, James didn’t dwell on what’s lost, who’s no longer around or how much time Cleveland has left to salvage its season. Cleveland added guards George Hill and Jordan Clarkson as well as forwards Larry Nance Jr. and Rodney Hood, and all will have to take a crash course in Cavaliers 101. The team sent some of medical staff to Atlanta in hopes of completing physicals before Friday’s game, but it’s unlikely any of the new additions will play until Sunday in Boston. Teams already are lining up for an audience with The King should he turn down $36.5 million and opt out of his contract. So the Cavs turned their roster upside down in hopes of convincing James he doesn’t have to go anywhere. So the 35-year-old GM’s first move in the overhaul was bold, requiring him to swallow his pride and scuttle the blockbuster trade that brought Thomas and Jae Crowder to Cleveland last July in the deal for Kyrie Irving. Crowder was also traded Thursday to Utah. And it wasn’t just Thomas’ poor shooting and defensive holes, he irked teammates and coaches with public comments. He was also in the middle of a heated team meeting when he questioned why Kevin Love left a game early and missed a practice. Altman’s renovation also included trading Wade back to Miami, where he’ll finish his career with the franchise that drafted him and the one he put on the map by winning three titles – two alongside James, who was thrilled for him. While Altman’s main objective was to repair Cleveland’s culture, he also wanted to spark James, who hasn’t been himself in recent weeks. However, with the deadline hours away, James put together a 37-point, 15-assist, 10-rebound game on Wednesday that he capped with a buzzer-beating shot in overtime to edge Minnesota. Just last week James expressed doubts about the Cavs’ commitment to fixing their roster. He watched other All-Stars get traded since the end of last season and wondered if Cleveland was going to make changes. He doesn’t have any doubts now. The Cavs made their moves.